Baby, take a chance, on a pleasure cruise, baby in a trance. My name is Jeff. 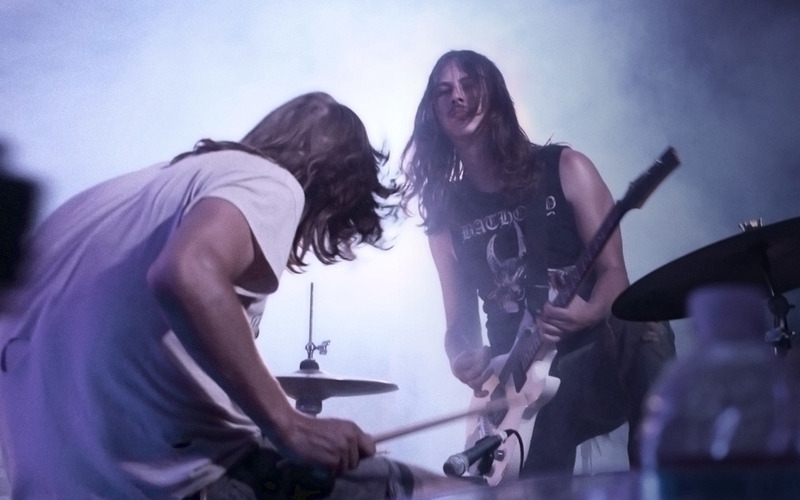 JEFF the Brotherhood is a two-piece garage rock band from Nashville, Tennessee. Formed in 2001, the group consists of siblings Jake Orrall (three-string guitar, vocals) and Jamin Orrall (drums). JEFF the Brotherhood's sound can be described as stripped down garage punk with grunge and psychedelic influences. The group is known for their rigorous touring schedule, which included 230 dates in garages, venues and festivals in 2010. In 2011, Spin Magazine named JEFF the Brotherhood a "must-hear act" at the highly esteemed South by Southwest festival in Austin, Texas. JEFF the Brotherhood has released 7 LPs and 7 singles since their inception in 2001; most of which on their own family run label Infinity Cat Recordings. In 2011, the Brotherhood released Live At Third Man under Jack White's label Third Man Recordings, and later We Are the Champions on Infinity Cat. Based on the title of their latest album, We Are The Champions, you might think that JEFF the Brotherhood have put out a tribute to Queen. But instead of a collection of rousing stadium rock anthems, the Nashville duo have followed up 2009's Heavy Days with their own collection of psychedelic-twinged garage rock and grunge. Known for their frenetic and frequent live shows—they played over 230 concerts in 2010 alone—brothers Jake and Jamin Orrall have established a name for themselves in Nashville's rising garage rock scene with JEFF the Brotherhood. And with We Are The Champions, it isn't hard to hear why. “Cool Out” is rowdy and aggressive, with an extra-trashy feel courtesy of Jake Orrall's three-stringed guitar and Jamin Orrall's rapid drumbeats. It's the sonic equivalent of that one dude who always seems to get the mosh pit started at a sweaty underground punk show. Bringing to mind first-wave punk bands like The Replacements, “Shredder” starts off like a rumbling motorcycle rearing to take off before developing into a garage punk frenzy. At two minutes and three seconds, it's also the shortest song on the album—and one of the most infectious. Mellowing things out (just slightly) is “Diamond Way”, where the drumbeat reigns supreme at the start of the song. There's a beachier punk feel, with Ramones-inspired “whoa-oh-ohs” that will have you imagining skate rats grinding their boards on concrete curbs amidst rows of palm trees. But just when you think JEFF the Brotherhood are bound to the minimalist and brash feel of garage, they come in with “Endless Fire.” Jake's vocals are higher—almost falsetto—and there's a 60s psychedelic feel with the incorporation of keys. Continuing the 60s psychedelic feel is “Health and Strength,” but it goes one step further with the use of Eastern-sounding instrumentation like sitars and tambourines. Still, the element of grunge hasn't completely disappeared, as there's enough guitar distortion to keep it sounding relevant to this millennium. While We Are The Champions may not have the anthemic sporting victory quality of Queen's “We Are The Champions,” it packs in a head-banging punch that will have you raising your red plastic beer cup in a glorious toast to awesome new music.